Lots of you have got in touch with the BBC about what a possible exit from the EU might mean for travel and living abroad. We've answered some of your questions below. The question: K.Y. emailed the Reality Check team to ask: "If the UK were to leave the EU, would the European Health Insurance Card still be valid?" 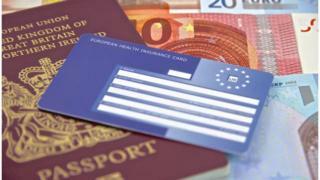 The answer: Citizens of all EU countries can get the European Health Insurance Card (EHIC), which entitles them to state-provided emergency medical treatment within the EU country they are visiting. The UK already has reciprocal deals with a number of non-EU countries, including Australia, Israel and Russia, under which visitors can receive free urgent treatment. If the UK left the EU, it could agree similar deals with EU countries. In the event of a Brexit, the presumption is that all the existing rules would be in place while the UK and the EU negotiate the "divorce deal". Under EU rules, the negotiations would take up to two years and could be extended if all the EU countries agree they needed more time. Find out more about what Brexit might mean for health costs here and as we've outlined here, there are currently about 1.2 million British citizens living in other EU countries. The question: Claire asked BBC Radio 4's PM programme: "My British son is married to a Japanese girl and lives in Japan currently. Which would be more likely to make it easier for my son to bring his wife here? In or out of Europe?" The answer: Your son should be able to bring his wife into the UK on a spouse visa provided he can meet the minimum income threshold of between £18,600 and £27,200 depending on whether they have children, can show he will be able to financially support his partner and has accommodation lined up in the UK. His wife will not be able to access benefits or public housing until she is legally settled and she will also have to pass an English speaking test in order to be admitted to the country for settlement. Immigration rules, including those applying to non-EU spouses, have tightened in recent years in line with government targets to reduce migration, introducing the minimum income, increasing the probationary period before permanent residency is granted ("indefinite leave to remain"), from two years to five and making the English language test more difficult. Those changes mean it is actually easier for non-British EU citizens to bring their non-EU spouses to the UK than for UK citizens to do so. See here for more. The Vote Leave camp argues that by suppressing EU migration, the UK can create a level playing field and make things "fairer for the Commonwealth". They imply Britain may be able to grant entry to more people from the rest of the world, in place of the EU citizens who currently take precedence, although this is mostly focused on skilled professionals with particular qualifications. But whether the UK end up denying access to some EU migrants depends on what deal is reached - free movement may have to be accepted to gain access to the single market. If Britain is able to end freedom of movement, either by leaving the single market or by negotiating an opt-out, it is likely the barriers to migration for EU citizens will be raised in line with the current situation for non-EU citizens rather than lowering the bar for non-EU migrants. The UK already experiences net migration far above government targets and Brexit alone is unlikely to be enough to meet them. If the government remains committed to reducing net migration, logic dictates Brexit would lead to an overall tightening of immigration rules, including for non-British spouses, rather than relaxing the rules for any one group. The reality is - we don't know how immigration policy will change in the future whether we stay in or leave, and we don't know what kind of deal will be reached in the event of Brexit so it's a matter of speculation which scenario would make it easier for your son to bring his wife here. The question: Liza emailed the BBC's Reality Check team to ask: "Please could you tell me what would happen to pet passports if we left the EU? Would we still be able to take our pets travelling across Europe without having to go back to quarantining them?" The answer: If you are travelling within the EU, you can currently enter or return to the UK with your pet without quarantine provided that certain conditions are met (such as having a pet passport and your pet being microchipped). Pets from non-EU countries may have to meet additional stricter requirements in order to enter the EU, including blood tests or quarantines. However, the EU pet travel scheme divides non-EU territory into listed and non-listed countries. Listed countries outside the EU are those with similarly robust surveillance and reporting systems with regard to rabies (among others) and so they are not subject to these additional requirements. If the UK were to leave the EU, it could then make an application to the European Commission, demonstrating that it fulfils the required conditions to become a listed country for the purposes of the EU pet travel scheme. If such an application were successful, a pet would not have to go into quarantine travelling to and from another EU country, even if Britain was no longer a member of the EU. The question: Jeff asks BBC Radio 4's PM programme: "How would leaving the EU affect the cost of our holidays?" The answer: If you accept that a Brexit would weaken the pound, it would be reasonable to expect this would make foreign holidays more expensive, but it is hard to predict a precise figure. We've looked into this in more detail here. Another EU regulation will abolish roaming charges in EU member states from 2017, though we can't say for sure whether this would affect British consumers if the UK voted to leave the EU. You can find more about that here. We've also investigated whether the UK leaving the EU could lead to an increase in air fares. The impact could be reduced or even avoided depending on what agreements the UK reached with the EU and other countries. Keep your questions coming by email (realitycheck@bbc.co.uk) or via Twitter @BBCRealityCheck and we'll answer as many as we can before 23 June. Reality Check: Would Brexit cost your family £4,300?